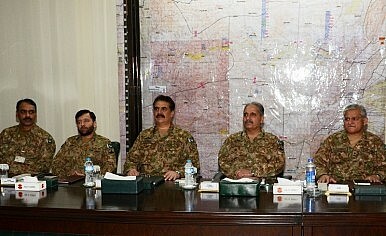 Pakistani General Raheel Sharif, Chief of Army Staff, during a June 16 briefing on operation Zarb-e-Azb. Pakistan’s operation Zarb-e-Azb will target anti-China terrorists along with domestic Pakistani terror groups. A deadly attack at the Karachi airport has prompted the Pakistani government to strike back against terrorist groups based in the North Waziristan tribal region. The Pakistan Army launched operation Zarb-e-Azb on Sunday, targeting both domestic and foreign terrorists. Citing an Inter-Services Public Relations (ISPR) statement, Dawn reports that “at least 120 suspected militants” have been killed in the operation so far. The announcement of operation Zarb-e-Azb came after overnight airstrikes reportedly killed 50 foreign militants. Zarb-e-Azb will involve more than just air-strikes, however; 25,000 to 30,000 troops are expected to take part, according to a security official interview by Dawn. The statement from ISPR left no doubt as to the end goal of the operation: “Our valiant armed forces have been tasked to eliminate these terrorists regardless of hue and color, along with their sanctuaries,” ISPR Director General Maj. Gen. Asim Bajwa was quoted as saying. He added, “these enemies of the state will be denied space anywhere across the country.” According to the Associated Press, Pakistan’s Defense Minister Khawaja Muhammad Asif has also expressed strong support for the operation on Pakistani television, calling it a “do-or-die war.” “We will fight it till the end,” Asif promised. The Pakistani military’s most immediate goal is naturally to ensure the safety of their own citizens by targeting terrorist groups with an inclination to carry out domestic attacks. However, now that the military operation is underway, targeting ETIM is probably high on Islamabad’s priority list as well. The presence of the anti-China terrorist group in Pakistan’s tribal regions has been a source of concern for China, which is in the midst of its own declared crackdown on terrorist activities. But China’s domestic anti-terror activities can only get so far when groups like ETIM have found a safe haven along the Afghanistan-Pakistan border. Accordingly, China has been leaning on Pakistan to take a more active role in the fight against terror. Given the historically close relationship between Beijing and Islamabad, this pressure has been subtle, and framed in the politest possible way. But China’s concerns are obvious, and Pakistan has received the message: deepened economic cooperation between the two countries (which Islamabad desperately needs) will proceed much more smoothly if China’s security concerns are assuaged. Thus, when Pakistani President Mamnoon Hussain met with Chinese President Xi Jinping last month, Hussain called ETIM a “common enemy” of Pakistan and China. Pakistan’s anti-terror operation was spurred by the domestic attack at Karachi, but now that it is underway, Islamabad will likely seize the opportunity to prove it takes China’s concerns seriously. Already, Beijing is reacting very positively to operation Zarb-e-Azb. China’s Foreign Ministry expressed its support for the Pakistani initiative, with spokesperson Hua Chunying saying that “China always stands by the Pakistani government in implementing and moving forward its counter-terrorism and security strategies based on its national conditions.” Hua also praised Pakistan’s sacrifices and “positive contributions” in the fight against international terrorism. On the subject of ETIM, Hua acknowledged the reports that members of the group had been killed in the Pakistani strikes. “Fighting against ETIM terrorist forces is an important component of the international counter-terrorism campaign,” Hua said, noting that China and Pakistan will continue to cooperate on such efforts. A strong military response against terrorist groups holed up in Pakistan’s tribal regions, including ETIM, can only benefit China-Pakistan relations. Operation Zarb-e-Azb sends a strong signal of Pakistan’s resolve in fighting terrorism. While that message is mainly intended for a domestic audience horrified by the attack in Karachi, it is also sends crucial reassurance to China. If Beijing and Islamabad can find concrete ways to connect their twin anti-terror crackdowns, it will provide a major boost to the already-close relationship between these neighbors. U.S.-Pakistan frictions are not good for Beijing, either.